I know what you think about sofa slipcovers – ugly, boring, uncomfortable and ruining the look of sofas….well, these were exactly my thoughts! And that’s because I honestly hate all kinds of covers and cases, even for my car seats or smartphone. …so having first hand bad experience I have been finally convinced that I need one so started browsing most popular shops to find the perfect one. The one thing I realized is that sofa slipcovers are no longer ugly and uncomfortable, on the contrary there are some really beautiful and nice looking models, which you can use to redecorate your living room – cheap and quick. There are also pillow back sofa slipcovers available. I think there is time when sofa slipcovers are not only required, but they are a must have and I’m not talking about having little kids or pets. Think about the slipcover before your sofa start to look like this one. Not to mention that they are the best solution when you don’t want to replace your old and super comfy couch with a modern one. I have visited a number of retailers and the best by far is Wayfair – they have the biggest variety, competitive prices and I shopped with them previously so I knew their support is great. I don’t want you to waste your time and money looking for the best sofa slipcovers so here are the 7 Best Wayfair Sofa Slipcovers. You can easily and quickly compare their specifications and choose the one that suits you best. Moreover, buying quality sofa slipcovers doesn’t have to be difficult when you buy from a reputable company. A slipcover is a wonderful way to protect your investment, as sofas tend to be expensive. Instead of worrying about damage to your sofa or wanting to buy a new one because you are unhappy with the upholstery, slipcovered sofas are incredibly functional, attractive, and will remain in great condition for a long period of time. 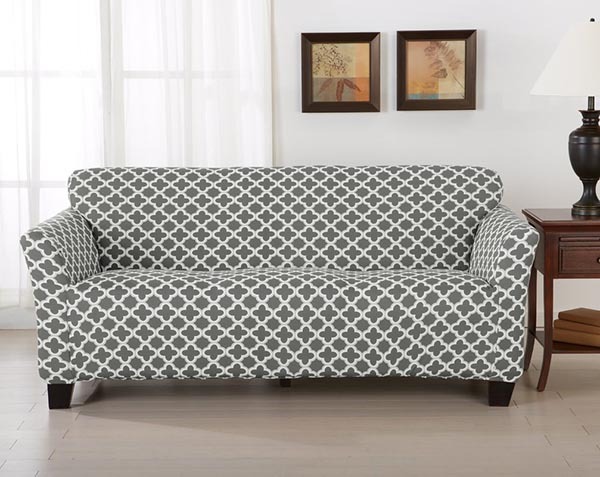 This is one of the most popular Wayfair sofa slipcovers, and for good reason. It is incredibly stretchy, as well as soft, which means it will fit tightly against your sofa without any wrinkles or gaping material. Made from a twill fabric that is not only attractive, but also very lightweight, this slipcover is very easy to put on your sofa. Ensure a nice and snug fit no matter if your sofa is shaped a little differently than normal. One thing that you’re sure to love about this slipcover is the fact that it can be washed in your washing machine. Because you don’t have to take the slipcover to the cleaners for professional cleaning, it’s a great option if you have kids who love to eat on the sofa and tend to spill. Reviewers love that even though this slipcover is sturdy and will stay in place once it has been put on your sofa, the fabric is very soft and makes sitting on your sofa comfortable. If you want a sofa slipcover, but aren’t interested in buying one that will fit tightly against your sofa, then this option from Winston Porter is a great choice. Unlike other slipcovers that attach to the sofa with either elastic or ties, this one rests on the top surface of the sofa. The back of the slipcover is longer than the front, which adds weight to the slipcover so that it will not slip off of your sofa. This is a single piece slipcover and can be easily put on and taken off of your sofa by yourself. Made of a microfiber material and filled with quality polyester batting, this slipcover is comfortable and will retain its shape easily. It’s a great choice for anybody looking for some extra protection for their furniture from pets or kids for only $28.99. 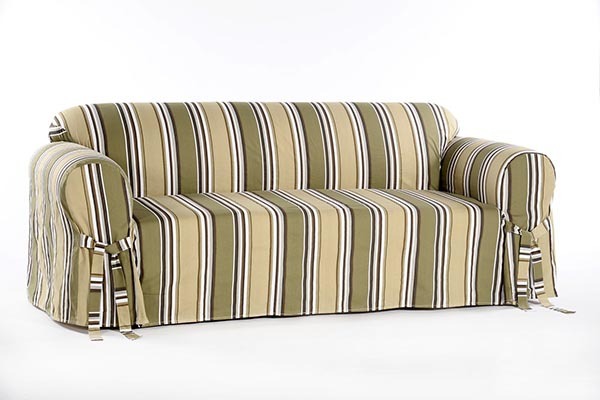 For a neat and attractive look, opt for a 3 cushion sofa slipcover such as this one from Serta. It has been designed to lay neatly on top of your sofa without any wrinkles. The ties on the slipcover make it easy to use and snug up to your actual piece of furniture, without losing the relaxed look. While this can’t be used on a reclining sofa, it works well on sofas with square arms and on camel-back sofas. 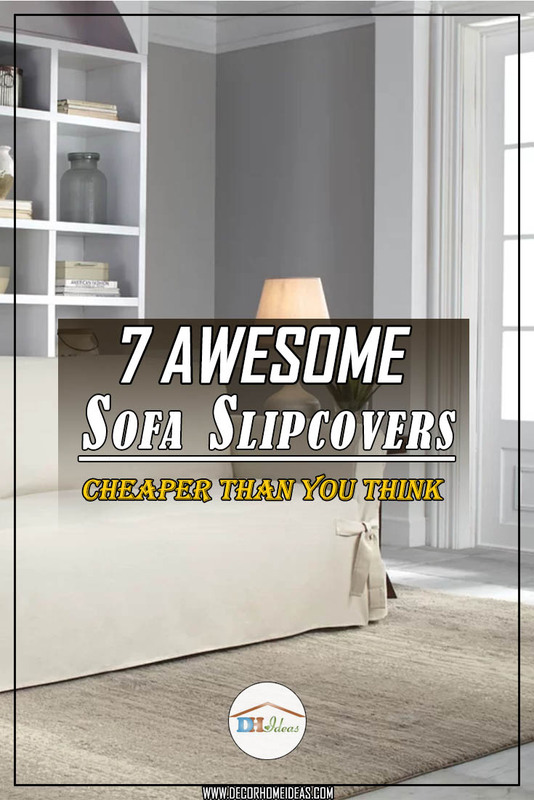 A benefit of this slipcover is that it covers the back of your sofa so that you don’t have to worry about it being damaged or appearing with a different color fabric if your sofa is in the middle of your room. One great way to get a lot of bang for your buck is with a reversible slipcover. Slipcovers for sofas often are only one sided, which means that you are limited in the appearance of your sofa. However, when you opt for a slipcover that is reversible, it won’t matter if you put it on upside down. This slipcover uses ties that can be neatly laid on top of your sofa if you are in a hurry. The fabric is very comfortable and doesn’t wrinkle even when you wash and dry it yourself. While this slipcover will stay in place easily on top of certain types of upholstery, if you want to protect your leather sofa you will want to use the included straps to make sure that it stays in place. 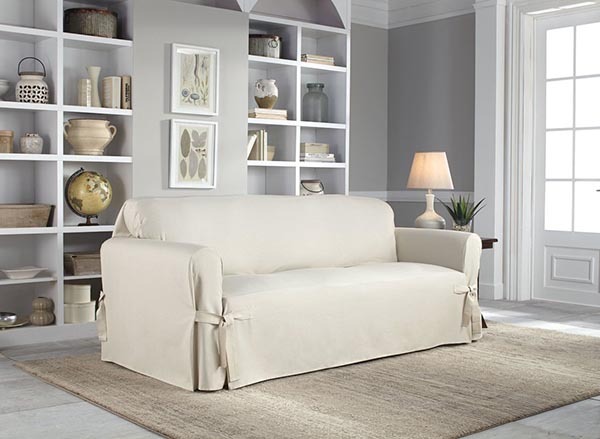 One of the main benefits of a slipcover sofa is that your sofa will look neat, new, and without wrinkles. If you want a smooth look to your sofa and don’t want to have to worry about tucking a lot of extra fabric in the cushions of your sofa, then this slipcover is a great choice for you. Made of a stretchy knit material with extra seams and pleats to ensure a snug fit, this slipcover will fit tightly onto your furniture’s contours. 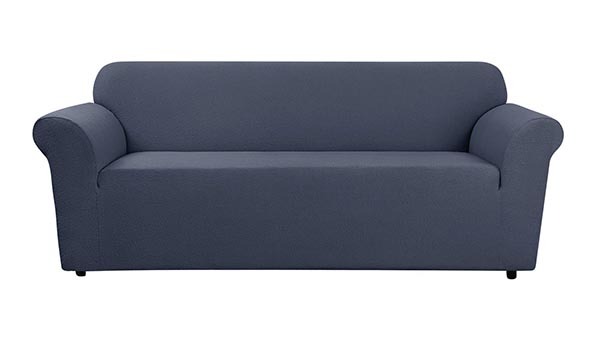 The extra elastic throughout the slipcover ensures that your sofa looks newly reupholstered. When shopping for Wayfair slipcovers for sofas, one popular type that you’re sure to find are skirted slipcovers. This option from August Grove is as durable as it is elegant. 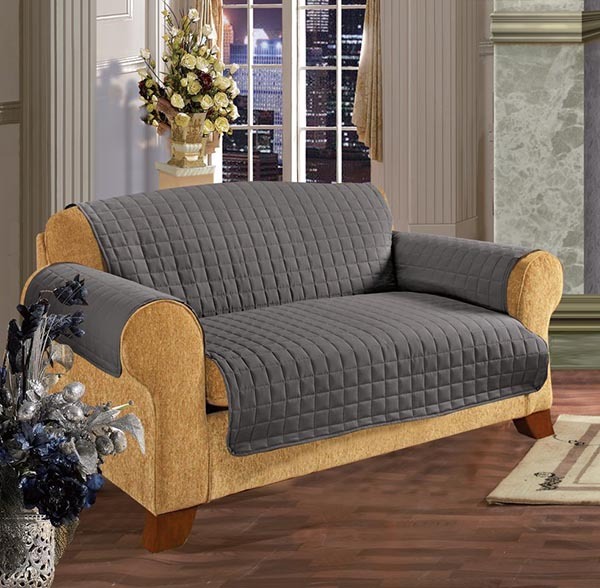 It consists of a full skirt that is separate from the cushion cover so you can rest easy knowing that the cushions are tight and professionally covered, while the ruffle adds elegance to your sofa. This slipcover attaches with ties and does a great job at hiding the legs of your sofa and creating a look that will look amazing in a classically decorated home or one that has French décor. Unlike other sectional sofa slipcovers, this option has an attractive pattern that will add a little bit of visual interest to your sofa. The sturdy canvas fabric is durable without being too rough or uncomfortable to sit on, although the thicker fabric is not as comfortable as other, softer options. Made of heavier-duty fabric than other types of slipcovers, it is able to stand up to roughhousing, spilled drinks, and dirty shoes. At just $74.99, it’s an affordable option for anybody looking to recover their sofa with a durable slipcover. When you want to cover your sofa to protect it or if you want to create a new look in your living room, you want to make sure that you have one of the best slipcovered sofas around. Unfortunately, lower-quality slipcovers will not last for a very long time or create a smooth look for your sofa. 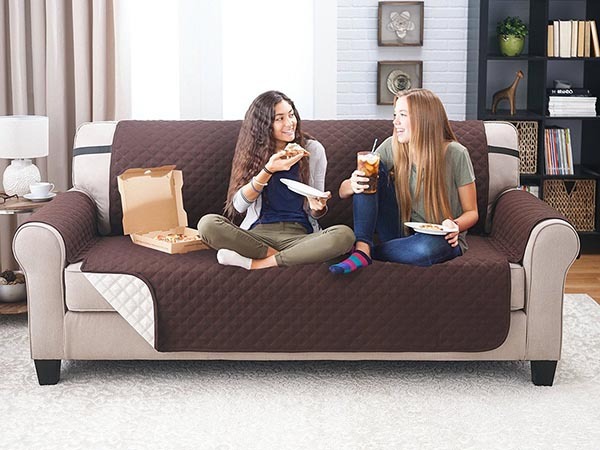 For this reason, it’s important to make sure that you buy quality slipcovers from Wayfair so you can rest easy knowing that your sofa will be protected without sacrificing quality and comfort. By choosing a slipcover that is attractive, comfortable, and easy to put on by yourself, you can rest easy knowing that you won’t have any problems washing it and replacing it when it gets dirty. What I’ve learned so far is that $30 slipcover can save a $2000 sofa or at least an expensive repairing of the fabric. Sounds like a good reason to spend some money on slipcovers, right?